$50.00 As Low As $2.00 ea. 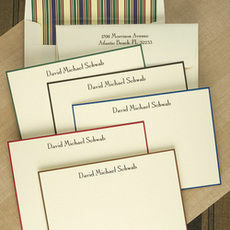 These white or ivory 6.25" x 4.5" flat cards come with raised ink personalization surrounded by a crisply embossed border. 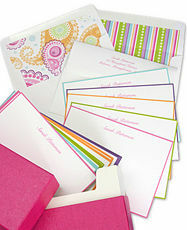 Printed return address and optional envelope linings available. Typestyle, positioning and format only as shown. You select raised ink color and stock color.